The topic of the article is S.F. Oldenburg’s role in the forming of Russian school of Buddhist studies. The author demonstrates S.F. Oldenburg’s key role in the researches concerning the spreading of Buddhism in Central Asia and Far East. Special attention is given to his research program of the Institute of Buddhist culture of USSR Academy of sciences and to the activities of members of the Institute during 1928-1930. Key words: S.F. Oldenburg, Saint-Petersburg school of Buddhist studies, Buddhism, Institute of Buddhist Culture AS USSR. The letters of Rennyo are based on the Shinshu textual tradition: Pure Land sutras, the commentaries of the seven Pure Land Masters, the writings of the founder of Jodo shinshu school Shinran, Kakunyo, Zonkaku. Rennyo’s Letters became a canonical text for the followers. The Letters (ofumi) were written in colloquial medieval Japanese language. Rennyo’s successors selected 80 letters in five-fascicle collection to be known as ofumi or jounai ofumi. 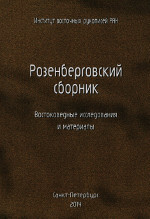 Seven letters from first fascicle compilation have been now translated into Russian and published. The goal of the publication is to present Rennyo’s words as accurately and clearly as possible, by using the most appropriate Russian equivalents of Buddhist terms and medieval Japanese language. Key words: Rennyo’s o-fumi, religious movement ikko-ikki, Buddhist school “Jodo shishu”, Shinran, Kakunyo, Zonkaku, Rennyo’s activities at Yoshizaki, Buddhist temple Honganji, Buddhist temple at Yoshizaki, followers of “Jodo shinshu”. Rennyo wrote more than 200 letters to his followers. Rennyo’s successors selected 80 letters in five-fascicle collection to be known as o-fumi or jounai o-fumi. Eight letters (from 8th letter, dated probably October of 1473, to 15th letter, dated 13th October 1473) have been now translated and published in Russian language at first time. Commentary is important part of research to understand correctly the meaning of the letter’s content. The paper focuses on four apologetic Buddhist hymns presented in the Tibetan Buddhist canon. The image of Shiva composes one of the major lines of these texts aimed at demonstrating the superiority of the Buddha and his Doctrine over Hindu deities and teachers of the orthodox darśanas as well as Jainism through the comparison of them. The anti-Shivaite motifs are expressed especially manifestly in Udbhaṭasiddhasvāmin’s The Hymn to the Omniscient Māheśvara in which various names and mythological plots related to Shiva refer in fact to the figure of the Buddha so that the latter, not Shiva, turns out to be the true Māheśvara, the Great Lord. The paper is supplied with the full translation of this hymn as an appendix. Key words: Buddhist hymns, apology of Buddhism, Udbhaṭasiddhasvāmin, Śaṅkarasvāmin, Śrī Harṣadeva, mythology of Shiva. The article is devoted to the theme of Buddhist influences on Taoist thought in late medieval China. As a source for the analysis the text came “Long men xin fa” (“Law of the heart/mind [according to tradition] Longmen”), which sets out the views of Kunyang-zi (Wang Changyue), mentor of Taoist Quan Zhen Jiao school. In particular, it examines the concept of two types of obstacles faced by those who follow the spiritual path. Terminology used in the relevant text passage from “Long men xin fa” is discussed in detail. A comparison of concepts of two types of obstacles in this Taoist text and medieval Buddhist treatises is conducted. Key words: Buddhism, Taoism, Quan Zhen Jiao (The Doctrine of the Perfect Truth), “Long men xin fa”. The article is devoted to the prospects of an anthropological approach to the study of traditional psychophysical practices in China. Special attention is given to the subdiscipline of social (cultural) anthropology known as psychological anthropology, in particular, the fundamental studies of E. Burginon. The main features of Chinese practices, namely, (1) the holistic nature, (3) an emphasis on the dynamics, (2) a genetic link with the ritual are briefly described. In an article the author provide a historical survey of the Buddhist Canon in Dunhuang. Before book-printing was invented the Buddhist Canon had been existing in different local versions. The editors of Tripitaka had been arranging texts according ruzang chapters of Buddhist catalogues. The Dunhuang Written Canon had been arranged in accordance of Da Tang neidian lu, later it was unified according Kaiyuan shijiao lu. Key words: Chinese Buddhism, Tripitaka, Dunhuang. The present paper deals with rare iconographical form of the great bodhisattva Mañjuśrīwith Thousand Arms and Thousand Bowls. The publication gives some data on depictions of such bodhisattva’s image found in several murals and sculptures as well as on a Chinese Buddhist esoteric text which probably was a textual source of such images. Key words: Mañjuśrī of the Thousand Arms, Esoteric Buddhism, Dunhuang, Wutaishan. When starting research on the history of any language the linguist must first tackle the problem of selecting the source-material, since the wider and the more accurate the coverage of a period with relevant texts, the more exact and thorough the description of the language of that particular period. With regard to the language of the Liuchao period is nearly all restricted to translations of Buddhist texts into Chinese as the most representative for the period in question. The source material for the Tang period is based on Buddhist yulu of the dhana school. The Tang Dynasty Chan-Buddhist yulu can be called the truly representative texts with regard to the colloquial language of the period. Key words: historical grammar, early translations of Buddhist sutras, Tang Dynasty Chan-Buddhist yulu, representative sources, Liuchao period, Tang epoch, Buddhist/ non-Buddhist bianwen. The present paper continues the topic of Buddhist sacred landscape and focuses on the monasteries as the most important artificial objects of sacred landscape organizing religious, economical and cultural life of entire regions in canonical Buddhist territories. Touched upon here is the problem of methods by which the profane space gets transformed into sacred space. In this connection the author considers isomorphism between the architectural lay-out of the Buddhist monastery and the structure of the ideal mandala space as well as the main rituals elaborated by Tibetan Buddhism for “space purification” and “removing the obstacles” when searching for the site and, later, laying the foundation stone of the monastery. In particular, examples of such rituals are cited here from the Namthar of the First Jamyang Sheypa written by his incarnation Konchog Jigme Wangpo. In the conclusion the author marks that the tradition of performing the rituals connected with testing, examination, appropriation and “taming” of the building site elaborated by Tibetan Buddhism may be traced to their descriptions in the literature of Sutras and Tantras. Key words: Buddhism, sacred landscape, Buddhist monasteries, mandala, ritual. The present paper is one in a series of articles devoted to Buddhist sacred landscape in Tibet, Mongolia and Buddhist regions of Russia. The author focuses on the role of landscape descriptions in historical and hagiographical literature and analyzes some abstracts from Tibetan and Buryat biographies (rnam thar). It is noted that place names in Buddhist historical and hagiographical texts not only serve to identify geographical objects but also offer important cultural and historical information and allow a deeper penetration into text. Landscape descriptions make indispensable part of Tibetan and Mongolian hagiographical and gnas bshad works. This fact points to a special interest of Buddhist authors in examination of landscape as sacred Buddhist space. Key words: Buddhism, sacred landscape, hagiographical literature, place-name study, landscape descriptions, gnas bshad. The topic of Śaṅkara’s treatise Upadeśa-sāhasrī (“Thousand teachings”) are pedagogic methods in Advaita Vedānta school of philosophy. They are based on the presupposition that a disciple knows and accepts fundamental teachings of the sacred texts. A teacher’s aim is to allay a disciple’s doubts concerning Upaniṣadic teachings and to demonstrate how they can be reconciled with the facts of everyday experience. This aim makes the structure of the treatise dialogical. Basis of argumentation is the thesis of Brahman as the only reality. Key words: Śaṅkara, Brahman, Advaita Vedānta, ancient Indian pedagogy. The phenomenon of religious consciousness in the philosophical systems of Ràmànuja (XI century) and Madhva (XIII century) is analyzed sub specie the concept of difference: key borderlines divide unitary (from the standpoint of Advaita Vedānta) reality into different ontological regions rooting in Hindu ritualistics intimated with the concept of sacral world order. Key words: Rāmānuja, Madhva, viśiṣṭādvaita, dvaita, dharma. The article deals with Hindu religious hymns “nama-stotras”, their functions and meanings in ritual practice. This work analyzes the main Vishnu names. Key words: Hindu practices, Vishnu, Vishnu names, hindu hymns. The paper presents an analysis of the thirty six onto-epistemological levels of reality (36 tattvas) in the monistic Śaivism based on the treatise Śaṭtriṃśattattva-saṃdoha and its commentary Vivaraṇa by Rājānakānanda. The text along with the commentary is translated into the Russian language for the first time. The translation is supplied with corresponding exegetical notes. The text of the treatise is identified as a part of the first chapter (viz. I.28-48) of Saubhāgyasudhodaya by Amṛtānanda (XII- XIII A.D.). The verses of the text are analytically compared with the corresponding verses from Saubhāgyasudhodaya. Key words: India, Hinduism, tattva, Parādvaita, Kashmir Shaivism, Amṛtānanda, Śaṭtriṃśattattva-saṃdoha. The article presents analysis of epithet Ajita (‘Unconquered’) in Indian texts of different religious traditions: Vedic, Jain, Buddhist, Hindu. The broad range of written sources is involved for it. The author concludes on graduate transformation the epithet Ajita from the characteristics of Aryan military valour to the meaning, marking by itself the steadfastness of religious austerities. Key words: Buddhist sutras, proto-mahāyāna, Serindian collection IOM RAS, Sanskrit terms. The article is devoted to finding and describing structural specifics of the Chun Qiu Zuo Zhuan. Undertaking comparative analysis of number of structural elements in the first five chapters, I discovered that the elements relating to history records dominated over the elements relating to study of the Classics (the Confucian canon) as such. Hence is my particular interest in the relationship between the text of the Chun Qiu Zuo Zhuan and the tradition of history records of the Warring States Period (453-221 BC): I assume that further analysis of the Chun Qiu Zuo Zhuan (along with other written sources) will throw more light on the history of establishing in Ancient China such a form of history records as chronicles. Key words: source studies, textual criticism, structure of text, Ancient China, historical sources, chronicles, Chun Qiu Zuo Zhuan, the Confucian canon. This article is dedicated to the history of one of the most important ancient Chinese text “Shang shu”, also known as “Shu jing” (“The book of documents”), one of the “Five Classics”, which was based on historical events of Western Zhou period (1027-771 BC), legends and mythology of earlier periods of ancient Chinese history. This book has served as the foundation of Chinese political philosophy for more than twothousand years, also being part of Chinese traditional education. Besides, its texts can be used as historical sources on Western Zhou and the beginning of Eastern Zhou (770-454 BC) periods. The conducted researches of “Shang shu” (or “Shu jing” - “The book of documents”) showed that the book was created in two stages. The first part of the book (“Yu shu” - “The documents of Yu”) was written at the beginning of the 6th century. Earlier, during the 7th century, the three other parts (“Xia shu” - “The books of Xia”, “Shang shu” - “The books of Shang” and “Zhou shu” - “The books of Zhou”) were created. Some of them (chapters of “Zhou shu”) could probably be written on the basis of Western Zhou’s bronze inscriptions. The necessity of creation of this book was caused by weakening of the power of the kings of Zhou at the beginning of Eastern Zhou period (770-454 BC). Our research also showed that Confucius didn’t influenced on the texts of “Shang shu”, and that the book was not destroyed by the order of the first Chinese emperor Qin Shi-huang at 213 BC. Researching the accuracy of citing of “Shang shu” in many ancient texts, we discovered that the “The book of documents” hasn’t changed seriously during the second part of the first millennium BC. We can also say that the division into “Old text” (gu wen) and “New text” (jin wen) chapters is unreasonable. Key words: “Shang shu”, “Shu jing”, “Five classics” (Wu jing). The main problem this article solves is comparing a traditional text, a chapter of the Guo Yu, with an epigraphic text, which is the “He Lu”, found in the tomb in Zhangjiashan. The comparison is based on structural and formal criteria. From the comparison it follows that both texts belong to the same genre, which means, that during the Zhanguo period there were numerous texts of different genres, only some of which later comprised the Guo Yu, which now is likely to appear as a collection, or a selection of texts, which had existed in independent form before they were included in the Guo Yu. A broader methodological conclusion which follows from the research is that the traditional texts probably consist of fragments of different texts of different genres, which are now likely to appear unearthed as epigraphic texts on bamboo strips, but not in the that very form, in which they were included in the traditional sources. So the need may arise for the scholars to perform different operations of formal analysis and comparison, in order to determine the character of connection, that is likely to bind the epigraphic texts (whose genres often only seem to be unknown and new to scholars) with the traditional ones. Key words: epigraphic, sources studies, textology, Guo Yu, He Lu, ancient China. The article is devoted to the analysis of traditional Chinese coming of age ritual as it’s described in the canonical text “Ceremonies and Rituals” (“Yi li”). The prescribed sequence of ritual acts is reconstructed and the symbolic meaning of ceremonies is revealed, as well as a brief outline the historical development of the ritual guan from ancient times up to Late Imperial period. Key words: Confucian canon, coming of age ritual, the ritual practices of the ancient and medieval China. The article deals with the sociological analysis of Islam. In accordance with the theory of institutionalization of traditional religious ideologies the authors reveal the key components of the Islamic worldview - the category of “activity” and its system of values, and normative regulation. The research focuses on Islam as traditional religious ideology that has its own universal model of society. Sociological reconstruction of Islamic society model is aimed at identifying the basic institutional foundations of sociocultural self-reproduction of Islam, a method of legitimizing political power and socioeconomic stratification. Key words: Islam, model of society, sociological research, Muslim institutes. This article observes the image of diverse religious life of the vast region of South and Southeast Asia in the account of Niccolo de’ Conti (ca. 1395-1469), a Venetian merchant, who travelled to India, Indochina and Nusantara in 1420-1430s. The narrative about his voyage was recorded by the papal secretary and Florentine humanist Poggio Bracciolini, who also compared Conti’s evidence with Pliny’s description of India. Conti described the Indian and Ceylonese Brahmins, which he considered the noble philosophers, Hindu festivals and sacrifices, the Nestorian community in India, headhunting among the Bataks, but didn’t mention the spread of Islam in the region. Key words: Niccolo de’ Conti, Poggio Bracciolini, the Republic of Venice, the history of India, the Brahmins, Hinduism, Renaissance, humanism, orientalism, the history of Sri Lanka, the history of Indonesia, the history of Thailand. Niccolo Conti (c. 1395-1465) was a Venetian merchant, who travelled to India and Southeast Asia in 1420-1430s. In 1444, Conti related his travels to the papal secretary Poggio Bracciolini. This narrative about Conti’s voyages and adventures was included in Poggio’s treatise «On the Vicissitudes of Fortune». In his description of the Brahmins, Conti defines them as philosophers (genus philosophorum) and sorcerers and doesn’t mention any priestly functions of the Brahmins. The Venetian traveller ascribes the functions of the priests to another group, so-called Bachali. In Poggio’s record they are called genus sacerdotum. Conti’s account was an important milestone not only for the increase of European geographical knowledge, but also for the development of the orientalist discourse. Key words: Niccolo Conti, Poggio Bracciolini, the Republic of Venice, the history of India, the Brahmins, Renaissance, humanism, orientalism, the history of Sri Lanka. This article is focused on integrating Kalmyk elite in the Russian culture. The case of the princes Tyumen’s family is analyzed. The article presents family’s history and shows the reasons which led to the sedentary lifestyle. Based on the archival documents and other written sources author is analyzing the economic and cultural activities of the princes Tyumen. Key words: Kalmyks, Jungars, Princes Tyumen. The paper contains short «parallel lives» of O.O. Rosenberg and some other Russian Japanologists of the past century. O.O. Rosenberg (1888-1919) was one of the stars in the brilliant galaxy of Japanologists which appeared in Russia in the second decade of the 20th century. He was the eldest in the group, but was the first to die. The lives of his colleagues and friends followed various courses. Next in age was Sergei Grigorievich Elisseeff (1889-1975), the first European to graduate from Tokyo Imperial University (in 1914). In 1920 he fled from Russia together with his family, lived for some time in France, then moved to the USA. He is considered the founder of modern Japanese studies in the West. The biographies of Nikolai Iosifovich Konrad (1891-1970), Yevgeny Dmitrievich Polivanov (1891-1938), and Nikolai Aleksandrovich Nevsky (1892-1937) are more or less known, even though they have not yet been properly described. Nevsky’s peer Orest Viktorovich Pletner (1892-1970) worked in Japan since 1917. In the early 1930-s he also (like N.A.Nevsky) considered the possibility of returning to Russia, but changed his mind and lived in Japan a long, fruitful and, evidently, quite happy life of a university professor. He died, like Konrad, in 1970 and was buried in the city of Kobe, close to his Japanese wife. Vladimir Mikhailovich Konstantinov (1903-1967), a pupil of Konrad, spent in prison the «standard» eighteen years (1937-1956), but during the last ten years of his life managed to do a lot as a Japanologist. In comparison with these lives, the early death of O.O. Rosenberg was, perhaps, not the worst fate. Key words: Japan studies in Russia, Russian emigres after 1917, O.O. Rosenberg, S.G. Elisseeff, N.I. Konrad, Ye.D. Polivanov, N.A. Nevsky, O.V.Pletner, V.M. Konstantinov. An article is devoted to E.E. Uhtomsky’s views on the Russian power and politics, which were objectivated in his journalism. Authors demonstrated Uhtomsky as columnist on the base of very rare materials - newspapers 1900-1910th. So his position in the Russian Far Eastern policy was explicated. As a result his views were characterized as protoeurasism. Key words: E.E. Uhtomsky, East-West, Russia and the East, Russian diplomacy at the Far East at XIX c.
The article deals with the current state of sociology of education in East Asia region countries - China, Japan and Taiwan. The history of sociology of education in these counties is briefly outlined. The main theoretical approaches and directions of empirical research are analyzed. Key words: sociology of education, regional traditions in sociological study of education, localization of sociological theory. The article analyzes the constellation of problems that have arisen at the postSoviet political and economic area in relation to global geopolitical transformation of the world. Cooperation between Russia and China may be put into question in light of the rapidly growing international confrontation of Iran, EU attempts to diversify its access to energy, and steadily increased US military presence on the territory of new states Central Asia. Key words: Central Asia, geopolitics, new independent states of the Former Soviet Union. Henry Thomas Colebrooke (1765-1837) was one of the first European orientalists, who made a valuable contribution to the formation of Indian studies in modern Western world. He wrote first descriptions of Indian philosophical systems, religious practices, legal institutions and science in ancient and medieval India. He analyzed Indian culture in comparison with the Western one, what makes him one of pioneers of comparative studies in philosophy. Key words: comparative philosophy, history of Oriental studies, history of philosophy, history of mathematics, Indian law, H.T.Colebrooke. Memoirs about I.P. Minaev by his nieces W.P. and A.P. Shneider is interesting archival source which helps us to understand biography and contacts of these outstanding indologist. Moscow line of his biography and contact circle is explicated in this memoirs, and it is new information for modern readers. Key words: A.P. Shneider, W.P. Shneider, I.P. Minaev, The Archives of the Orientalists at Institute of Oriental Studies RAS. The paper focuses on two episodes from the history of the Tibetan collection kept at the Asiatic Museum / Institute of Oriental Studies, the USSR Academy of Sciences that involve the name of M.I. Tubyansky (1893-1937). Although a working hypothesis on the possible contribution of M.I. Tubyansky to the enlargement of the collection turned out to be false, these two episodes documented in the IOM RAS archives allow us to include his name into the history of the development of the IOM RAS Tibetan collection. Key words: Mikhail Izrailevich Tubyansky, history of Oriental studies in Russia, Asiatic Museum, Institute for Buddhist Culture (INBUK), Institute of Oriental Studies of the USSR Academy of Sciences, the IOM RAS Tibetan collection, Mongolian Science Committee. Archives by M.I.Tubiansky (letters to R.I.Sheinman, acad.Th.I.Stcerbatsky and S.F.Oldenburg) concern three phases of his life: education at St Petersburg University, different fields of professional activity at Petrograd-Leningrad, Mongolian period and last year at Leningrad. This collection of letters is an important source for description of his personality and scientific interests in the field of philosophy and oriental studies. Key words: Archives of Orientalists IOM RAS, M.I.Tubiansky, Th.I.Stcerbatsky, S.F.Oldenburg. An article deals with original writing tradition evolved and developed in India. Author demonstrated that tradually it spread over the couxtries of the Indian culture region, mostly via Buddhism. Among the variety of Indian writing systems historical priority belongs Stated, that of brahmi used for putting down Sanskrit texts, and pali associated with southern Buddhism. Main types of Indian manuscripts (materials, writing tools and design) were demonstrated on the base of Indian manuscript collection of IOM RAS. Key words: Indian manuscripts collection of IOM RAS, Buddhist manuscripts, languages of the Buddhist canonical texts, Indian writing systems. The topic of the article is the history of collecting and perspectives of study of the Buddhist manuscripts kept in the Indian part of collection of IOM RAS. The structure of written heritage of Northern Buddhism is shown in correlation with specific features of Buddhist manuscripts kept in IOM RAS. Special attention is paid to the Sanskrit part of the collection. The article demonstrates the main problems and perspectives of study of the Buddhist manuscripts in the context of contemporary research trends. Key words: Buddhism, Buddhist manuscripts, India, Indian collection of IOM RAS.